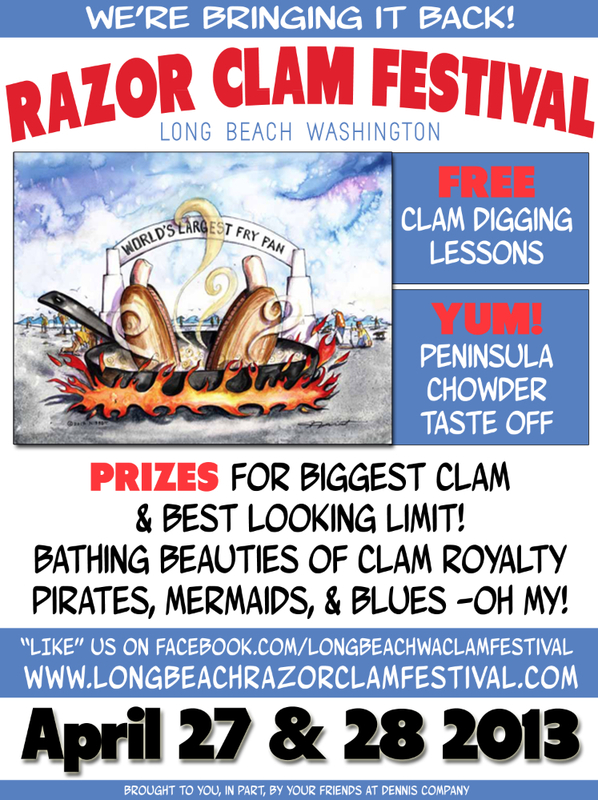 Washington's Long Beach Peninsula will celebrate cherished Northwest tradition of digging for razor clams with clam chowder cook-off, best decorated clam gun, biggest clam dug and best limit of clams during Long Beach Clam Festival, April 27 and 28, on Washington's Long Beach Peninsula. Free clam digging lessons offered both days at 7AM. 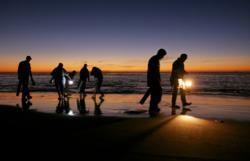 Eager clam diggers with lanterns, clam guns, shovels and buckets in hand search for telling signs of clams at dusk on Washington's Long Beach Peninsula. "Clam digging is a cherished part of our beach culture and heritage." Long Beach is bringing back the Razor Clam Festival, an event originating in the 1940s and successfully promoted by the touring of a giant frying pan throughout the region. The upcoming festival will be held April 27 and 28, in Long Beach, on Washington’s Long Beach Peninsula. Randy Dennis, event organizer and owner of the Dennis Company, made the announcement. The festival highlight is a Razor Clam Digging Competition, which takes place during an early morning clam tide on Saturday, April 27. For those that choose to show off their clams at the Dennis Company, prizes of a $100 Dennis Company gift card for the biggest clam dug, a stainless steel clam gun for the best looking limit, and a $50 Dennis Company Gift Card for guessing the correct number of clams will be awarded. Judging will be by representatives from Washington State Fish & Wildlife, who will bring the agency’s Clam Display. -Clam digging-related vendors at the Dennis Company store from 9AM to 2PM, April 27, with giveaways and drawings. Digging for razor clams is a popular beach activities enjoyed by residents and visitors, alike. With its long and expansive beach, the Long Beach Peninsula ranks among the favorite clamming destinations in the state. Note: License required, and limit enforced. On that same Saturday, April 27, the opening day of trout season, children are invited to participate in the Black Lake Fishing Derby, Ilwaco. Pre-registration guarantees an event t-shirt. Visitors can also enjoy bike rides, walks and runs on Discovery Trail, hiking at Cape Disappointment and Leadbetter state parks, bird watching all along the 28-mile peninsula, horseback riding on the beach, surf lessons (seasonal), kite flying, charter fishing (seasonal), beachcombing, shopping, and dining. Located on the southwestern-most coast of Washington State, the Long Beach Peninsula boasts an inviting mix of sought-out restaurants, ocean-view lodging, unique museums and attractions, lighthouses, fine art studios and galleries, meandering trails, exceptional birding spots, and, above all, a 20-plus mile long stretch of windswept beach. City dwellers “discovered” the rejuvenating benefits of the beach over a hundred years ago and have been coming ever since. The Long Beach Peninsula continues to be one of the Northwest’s most enjoyable and refreshing beach getaways. For event, lodging, dining and other destination information, please call the Long Beach Peninsula Visitors Bureau at 800-451-2542 or access http://www.funbeach.com. Long Beach Clam Festival Flyer: Long Beach, Washington, brings back famed 1940s Clam Festival, April 27 and 28, 2013, on the Long Beach Peninsula.The beachtown community of Long Beach, on Washington's Long Beach Peninsula, is bringing back its famed Clam Festival. 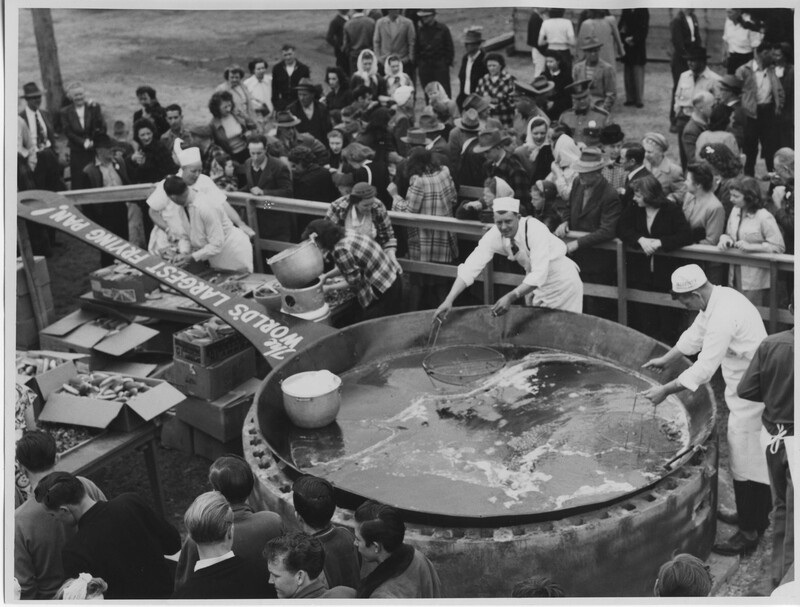 In the 1940s, the World's Largest Clam Pan was used to fry razor clams during the Long Beach Clam Festival. Photo credit: Columbia Pacific Heritage Museum, Ilwaco.World's largest clam pan at work on the beach in Long Beach during the Razor Clam Festival.